Pictured warming up for the Dublin City Marathon in support of organ donation and to raise money for the Irish Kidney Association were Anthony Fitzpatrick from Drumcondra (running to create greater awareness about the importance of organ donation), Ernesto Antonio from Galway (celebrating 15 years since receiving his life saving heart transplant) and Karl Cronin from Cavan (kidney transplant recipient). Picture Conor McCabe Photography. 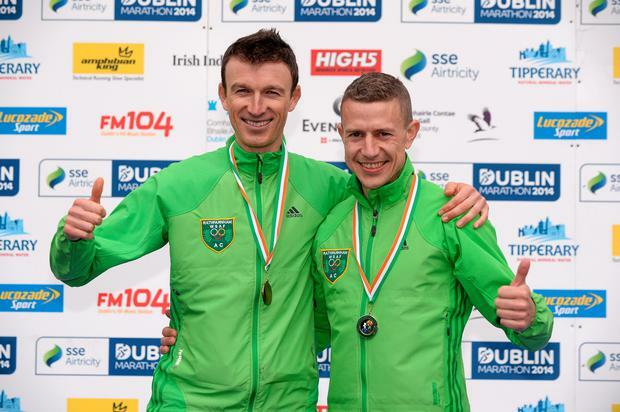 Pictured (l-r) at the Dublin City Marathon start line was Anthony Fitzpatrick from Drumcondra, Dublin reasons for running in the Dublin City Marathon are to raise funds for the Irish Kidney Association and create greater awareness about the importance of organ donation. Picture Conor McCabe Photography.